Can you imagine what would go through your mind if, upon returning to your campsite, all you found was the paper tag posted that showed you paid for the site? It does happen. 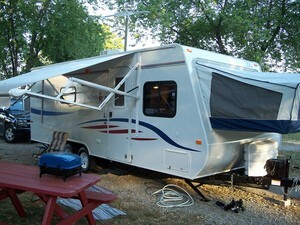 The scenario: You unhitch your fifth wheel or travel trailer and head into town to see the sights. As soon as you leave, someone backs up to your trailer with their pickup. In a matter of minutes, they’ve hitched up and headed off with your RV and everything inside it. They even picked up the lawn chairs and took the tablecloth off the picnic table. How could they possibly do this without anyone paying attention? Because they went through all of the same steps that most RVers go through when they’re packing up and leaving a site. To onlookers, nothing seemed out of the ordinary. By buying a special tongue or pin lock system, you will greatly reduce the likelihood of thieves making off with your RV trailer. For travel trailers, you have the option of putting a padlock through the hole on the hitch coupler. If you choose this as your only protection, be sure to close the coupler and then put the padlock through the hole. That way, any attempt to hitch up will be thwarted because the hitch won’t fit over a ball. This is only a mediocre way to secure your RV trailer. Someone could still drop the coupler over a smaller ball and, with care, they could still get it down the highway. A much better choice is a trailer hitch lock that is specifically designed to prevent theft. It clamps into the coupler in a way that stops the hitch from going over any ball, regardless of size. There are a variety of trailer hitch locks on the market. Be sure to get one that completely covers the coupler, so it can’t be lowered over a ball. Fifth wheel trailers don’t come with any way to snap on a padlock to secure them. Fortunately, there are a number of specifically designed fifth wheel hitch locks available that will block anyone from snapping onto your RV and hauling it away. You can also make do with a length of hardened link chain. Wrap it tightly around the pin and snap a padlock through it to secure it to the pin. The chain must be tight around the pin with no slack. Otherwise, the thieves will just unravel it, and off they go! With either style trailer, if it’s a tandem axle model with spoke style wheels there is another option. You can run a cable lock system through the wheels on one side and lock them together. If the wheels can’t turn, the trailer can’t be moved (or stolen). A length of hardened chain and a padlock will work, as well. Cable locks are also available They are advertised as next to impossible to cut and would be a more secure method. 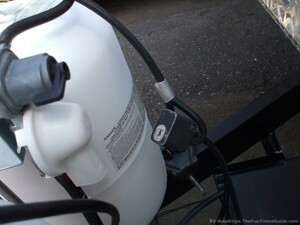 I use a cable lock system to secure my propane tanks to my trailer. There’s more to worry about besides your whole RV disappearing though. Many people aren’t aware of the fact that the storage compartments on at least 75% of all travel trailers, fifth wheel trailers, and motorhomes are accessed by the same key. If the key for your outside storage compartments has CH751 printed on it, then your storage areas can be accessed by almost every RVer on the road. 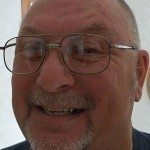 Sometimes when dealers get used RVs in on trade or purchased from auctions, they don’t get keys with them. Almost all keys can be ordered at RV dealerships, including master keys that will open all doors of a specific brand lockset. If the dealer doesn’t have the correct key when it comes time to sell a used RV, they will just give out master keys instead. It’s quicker and cheaper than replacing the door locksets. So, you might want to think twice before you leave valuable items in your RV storage compartments. It sure would be a shame if your fancy tailgating barbeque turned up missing one day. Those matching outdoor recliners you have were probably pretty expensive too. Those types of things are easy pickings when left in your RV storage compartment. If you leave your RV trailer in public storage when you’re not using it, you might want to remove some of the more valuable accessories that you keep onboard. The point I’m trying to make is that a fresh-from-the-factory RV with all factory locks in place can be entered in less than a minute by anyone who is aware of the shortcuts that the factories take to save money. Standardization is good for the factory, but doesn’t leave you with much security. When you turn in for the night or leave your RV unattended, always lock the deadbolt! A common saying is that locks simply keep honest people honest. If a thief really wants something, they will get it. There’s only so much you can do to prevent theft. Hopefully, if you throw a couple stumbling blocks in their way, they’ll go after the next guy who didn’t bother.